Every practice owner knows that a diverse patient population is key to a sustainable, successful physical therapy clinic. When it comes to marketing to attract new patients, most target younger populations (typically between 25 to 55 years old) as a way to build a solid patient base. This strategy aligns perfectly with business plans—promote your services to younger patients, provide PT that leads to great results, and create a reactivation population that will generate additional revenue from future visits. We also know that younger persons often seek physical therapy for one-time events, such as sports injuries or post-surgical rehab. Therefore, it is important to further diversify your patient population by treating seniors (ages 65+) who may need continuous or repeated care for chronic injuries or conditions. But marketing physical therapy to seniors can be a challenge! Practices often rely solely on “traditional” marketing based on the assumption that seniors are not online and will respond best to print, newspaper, or local media placements. Is this theory true? Let’s look at different types of marketing and see how your practice can customize them for the senior patient population. Seniors are an ideal audience for printed and mailed monthly newsletters. Direct mail provides the regularly, accessibility, and passive communication strategies that seniors prefer. This population knows to expect monthly newsletters and benefit from the convenience of having them delivered to their homes. Newsletters also do not feel “pushy” or aggressive. Many seniors do not want to feel pressured or “sold” by marketing. Seniors, especially those who aren’t online, appreciate postcards announcing upcoming events, incentives, or announcements. While it might be tempting to cram a lot of information onto one postcard, consider marketing content priority and readability/font size. A large, full bleed photo with an engaging headline on one side paired with a brief description of the hype and clear CTAs (Call-To-Action) with contact information is your best bet. Interested parties will call or, in some cases, visit your website to learn more. Branded Marketing includes brochures, rack cards, posters, flyers etc. and is also an effective way of marketing to seniors. The key consideration with branded materials is the availability of them in locations other than inside the clinic. Do you leave copies of brochures and rack cards at local doctors’ offices, especially those specializing in geriatrics? Have you networked with local senior centers, YMCAs, or HOA community rooms to leave marketing? These are all locations routinely visited by seniors and would be a great opportunity to reach out to new patients and reactivate past ones. You might be surprised by how many seniors utilize online marketing, specifically websites as part of their daily According to the Pew Research Center, almost 60% of seniors use the internet and of those, over 70% use the internet daily. And these numbers are continuing to grow! So when you are designing your website and creating its content, make sure to think about your senior audience. If you offer services or treatments that appeal specifically to older adults, call that out in your page copy. Do you have a dedicated Medicare billing specialist or referral coordinator? That feature could be a decision maker for a senior looking for physical therapy and you should market that amenity on your website. Also, pay special attention to font size and imagery. If the font is too small, seniors might struggle to read the text especially if using a mobile device. Imagery should also be relatable—it’s easy to gravitate towards young, active stock photos, but prospective patients will respond best to images they can empathize with (think seniors golfing, walking, or playing with grandchildren). Facebook and Twitter are just for the kids right? Wrong! In 2014, over 45% of seniors were actively using one or more social media platforms and those numbers keep growing. What is your practice’s social media marketing plan? And are you considering seniors as a key part of your audience? So now what? What can you do to improve your senior marketing plan? Take small steps—not every media need to be updated asap. Try adding a special call to action for seniors in next month’s newsletter, revising your website’s Medicare information to ensure its up to date, or distributing practice brochures at the local community center. 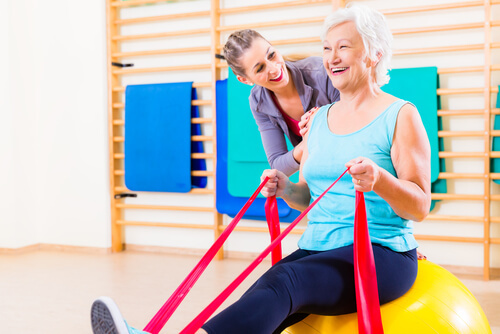 For more tips on how to successfully market your physical therapy practice to seniors, contact us today!